Economists trying to decipher the Monetary Policy Committee's (MPC) outlook for inflation and GDP growth for the current fiscal said providing authoritative projections on these statistics was difficult due to lack of clarity on many factors influencing them. On Thursday, the MPC came out with a highly dovish stance on inflation and GDP. It lowered its expectation on consumer price index (CPI) inflation to 4.7%-5.1% (including the HRA impact for the central government employees) in the first-half of the current fiscal from the earlier 5.1%-5.6%. For the second half, it is projecting the retail inflation to come in at 4.4% against the previous estimate of 4.5%-4.6%. The last CPI inflation figure put out by the government in February was 4.4%. 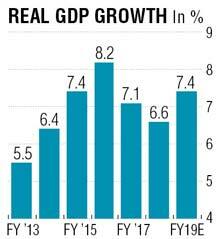 The committee's GDP growth projection this fiscal is also sanguine at 7.4% compared with last fiscal's 6.6%. Amit Sarkar, partner & head, BDO India, told DNA Money that even though prices have seen some stabilisation in the recent past, one has to get more clarity on some factors to put out a more accurate inflation number. "It (inflation) is unlikely to go up further. Food that is an important component (of headline inflation) has been moderating because of adequate food stock. Having said that, the finance minister had indicated in the budget that kharif crops would be purchased at minimum mark-up of 50%. How would that play out is now an interesting question," he said. Sarkar also feels that any slippage in the fiscal deficit on the part of the government could also see inflation soaring; "if the government runs away with the fiscal deficit and continues the fiscal indiscipline that is apparent in terms of meeting the spending target for infrastructure then you will have a lot of money supply getting generated in the economy. Logically, then prices will start going up, not because of shortage of goods but because of an economy flushed with cash". Aditi Nayar, vice president, principal economist of credit rating firm Icra, expect CPI inflation to harden to 5.3% by June. Upsurge in prices could be driven by the "the seasonal uptrend in food prices that sets in during the summer months", opines Nayar. However, Nayar expects inflation to ease in the later part of the current fiscal on favourable base effect. The Icra economist was waiting for clarity to emerge on many factors that could adversely impact inflation trajectory. "However, the impact of factors such as the spatial and temporal distribution of the 2018 monsoon and the operationalisation of the proposals made in the Union Budget for FY2019 including the launch of Operation Greens and the augmentation of minimum support prices (MSPs), which would impact the trajectory of food inflation going forward, remains uncertain. The trajectory of commodity prices, particularly crude oil, would also have an impact on domestic inflation in the coming months. International crude oil prices hardened in March 2018, the sustainability of which remains to be seen," she said in statement issued by the Indian rating agency. Economists are also sceptical on MPC's GDP projection as they are seeing little traction on investment and sectoral growth in the economy. "I have always had my scepticism about GDP growth, principally because if you are expecting GDP to grow further than what is happening right now – mid-6% - to mid-7%; then it is 1% increase. This means you will be adding $850 billion to the GDP of the Indian economy. Which are sectors that are going to contribute to it? Is it going to be consumption-led demand growth? Is it going to be investment-led cyclical growth" what will it be?" asks Sarkar. He expects Trump's protectionist stance on global trade to severely impact the information technology (IT) sector, which could stunt growth in the current fiscal. "The impact of Trump's Shenanigans are already affecting the IT companies. You are having a trickle-down effect because IT companies actually generate consumption demand because they create white collar jobs. One white collar job generates five blue collar job. That is the standard ratio. So, if the white collar jobs are not getting generated you cannot generate the blue collar jobs. HR surveys have also been saying that people's salaries are going to grow at a slow rate. All these will impact economic growth," he said. Icra's Nayar has also pencilled a lower GDP growth of 7.1% this fiscal, which was "mildly lower than the MPC's forecast". One has to get more clarity on some factors to put out a more accurate inflation number. Any slippage in fiscal deficit on the part of the government could also see inflation soaring.